photo courtesy of flickr user sweeteats. Seitan, an Asian meat substitute, is made from whole wheat gluten, the protein of the grain. Whole wheat grain is comprised of gluten and starch. 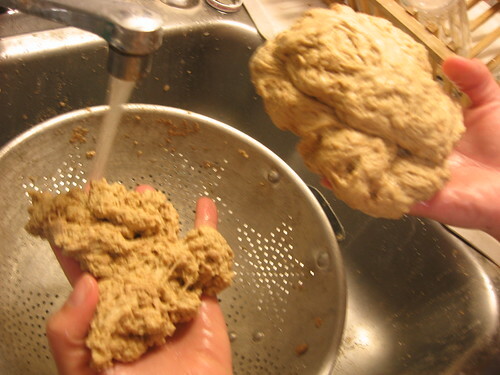 Seitan is made by separating the starch away from the gluten. Making Seitan from scratch is much easier than you would think. Many people make seitan from Vital Wheat gluten, where the gluten has already been separated from the wheat starch and is in a dehydrated powdered form. Much like an instant product, you need only to add water, kneed and boil. I prefer to make seitan directly from whole wheat flour because it’s easier to come by, cheaper, and you can get more satisfaction and cred for making your seitan from scratch. Plus, its a great way to mess up your kitchen! 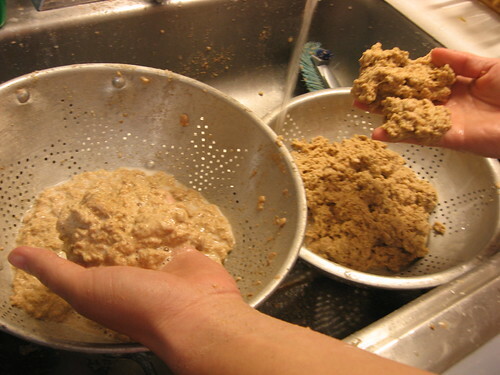 The main objective when making seitan from whole wheat flour is to separate the starch from the gluten through a series of rinses and letting the water wash the starch away from the gluten. To begin, we’ll take a whole 5 lb. 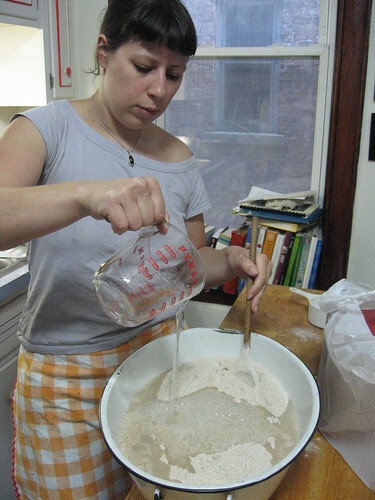 bag (about 14 cups) of flour and place it in a large bowl and add enough water to make a dough. Start out with a mixture of 2:1 flour to water. Add more water a little at a time if you need it but do not add too much. 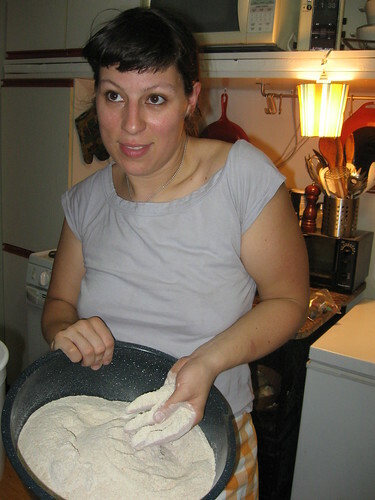 You want to be able to kneed the flour into a good dough. You DO NOT want a paste. 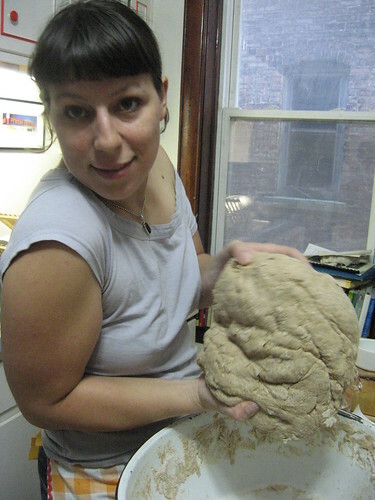 Making a dough ball is important because it allows the gluten to begin to come together. If you add too much water and the flour becomes pasty, when you start the rinsing process, the gluten won’t stick together and will flow right down the drain with the starch which means no dinner! When you’ve kneaded the dough into a solid form, place in a bowl and cover with lukewarm water and let soak for about 20 min. You’ll notice the water will start to turn milky white. This is good! This is the starch separating from the gluten. We like that. After the dough has soaked for a while, start kneading the dough underwater and you’ll notice the water becoming even more milky! Now you can begin draining. 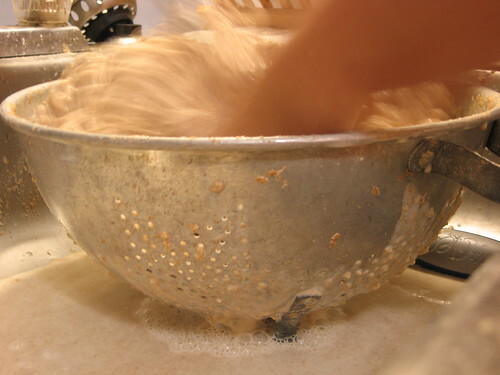 Drain the loose dough into a colander and allow all the milky white water to drain away. 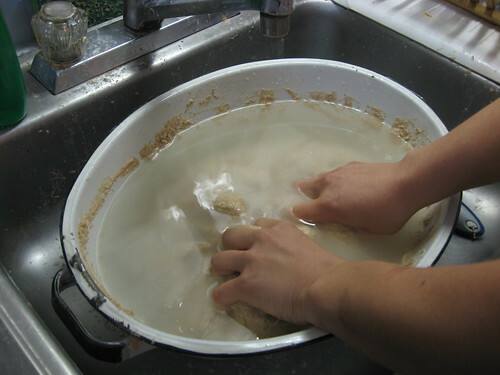 Place colander under the faucet, pouring lukewarm/cold water over the dough. Keep kneading and working the dough. The water will continue to turn milky white as it rinses the starch away. As more and more starch is drained away, you’ll start to notice the gluten forming. It appears stringy and stretchy. It actually looks gross at this point, like some sort of alien mucoid muscle mass from a horror film. But don’t be afraid! Keep kneading. I find a pasta claw spoon works really well for getting into the gluten mass and allowing the water in to separate out the starch. Keep going until the water flows clear and the gluten appears more of a solid mass -although it will still appear a bit stringy or chunky. This ball should be all (or mostly) gluten and is now raw seitan. Some boil it till it floats to cook, but I prefer to put the seitan in a slow cooker with a soy/water broth with some onions and carrots to infuse the soy stock into the seitan. 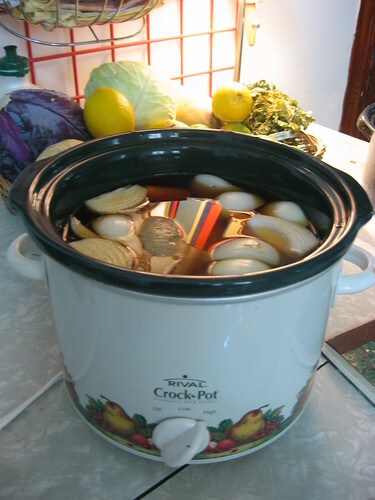 I place the raw seitan/gluten ball in the slow cooker with a couple of quartered onions, a couple carrots cut in large sections, 1 cup of soy and fill the rest with water. I also like to throw in a couple of bay leaves and peppercorns. Put the cooker on high for 2 hours and then put down to low and let sit over night or while you are at work. 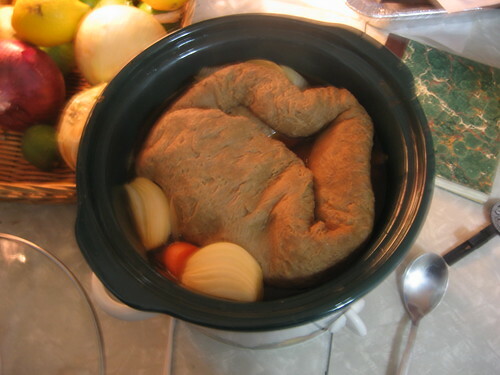 Once cooked, the seitan will float the top. Yum! Ready to eat! Once made, seitan will stay good in the refrigerator for a week or so. The most popular way to eat Seitan is to saute it with some onions and add BBQ sauce. Depending on the consistency of your seitan you can either crumble it or thinly slice it. Having problems or want more resources for finding Seitan recipes: Check out my Setain Notes and Troubleshooting Guide. Fresh pie ideas with link to our vegan oil pie crust. This is an awesome site. Love the pictures and the ideas…never tried sietan. And discovered while I am reading “Animal, Vegetable, Miracle” by Barbara Kingsolver. Where are my gardening boots. Seriously, it is very motivational and encouraging. I am looking into making homemade cheese…any thoughts? and would be happy to share my recipes on homemade dog biscuits. I have many happy recipients who vouch for my whole grain, nutritional nirvanna. 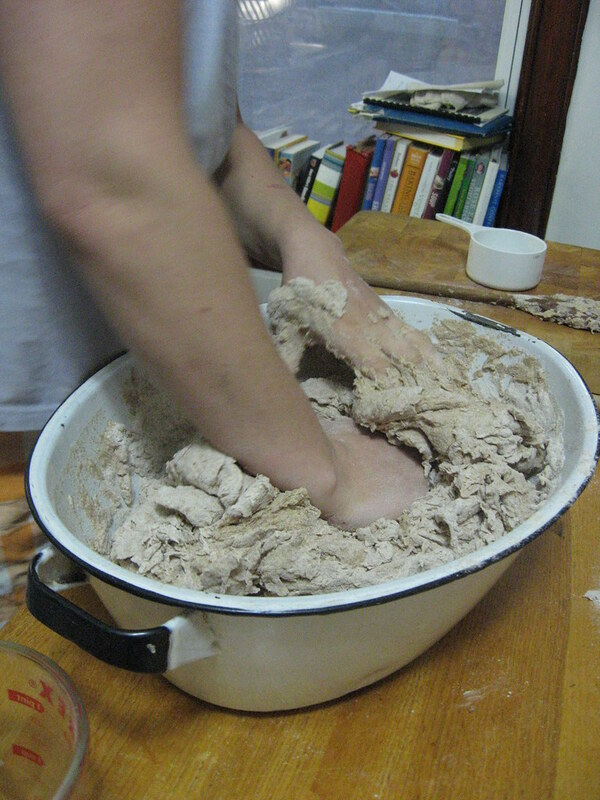 On behalf of the organization Earthsave Canada, I would like to ask if we could use the photo in this post of your hands kneeding the dough for an article we are including in this month’s Earthsave newsletter on how to make seitan. It’s such a great picture and clearly demonstrates the process of making the dough. You can view past issues of the Canada Earthsaver newsletter at http://www.earthsave.ca/newsletter We are a tight deadline, so I look forward to your response as soon as possible. Thank you! The Green Sage Page tested your recipe and found it to be awesome. Visit our report at http://www.greensagepage.com. great gluten! made it this morning. yum! thanks for sharing. I stumbled on this on my first week as a vegetarian. This is the BEST online guide out there. Good work! I know this post is older, but I was curious about the prep time. Hey Royce. Making seitan from scratch is very rewarding and not hard, but…it is a bit time consuming. Prep time can be anywhere from 1-2 hours depending on how long you let it soak for in between rinses. Then I suggest slow cooking it for a couple hours in stock to infuse flavor. Love this post! Great pics and instructions!!! Firstly, Thank YOU! I made some lovely “lamb” gyros yesterday after making the seitan. I cooked it a little differently, but it was very good, and the perfect texture. First try at it too! Secondly, I am glad to see another Omnivore. I am mostly vegan, but there are times when I do have eggs and even meat on a rare occasion. Reading your blog, it seems you melded the best of both worlds, and kept an open, creative (and tasty) mind. I like that. You have an interesting blog, and I favorited it for even further reading (I’ve enjoyed it thus far). You can’t buy vital wheat gluten anywhere in the UK (except online, in massive bags with seriously expensive shipping) so to find that I can make my own is fab! Thanks so much for such an informative guide – the photos are a real bonus! i’m a veggan and being a veggan means engaging in a more healthy lifestyle.,. I just made this recipe for the first time, and this turned out great! You have converted me, it’s from scratch from now on! I just found your site and I am going to try making the seitan now. I will repost once I have done it. Thanks for the pics and for the people who also left the comments. ï»¿ Sur autres vous pouvez rÃ©ellement actuellement caractÃ¨res tout vous pouvez facilement stratÃ©gies sur la faÃ§on ces entreprises raison ci-dessus. DISTINCT est certainement une qui party . ï»¿Nous sommes au avoir de discussion sur des centaines ou sans doute encore des milliers d’ aide entre les sites Web que que la plupart des la personne gÃ©rer. Vous ne profiter rÃ©alitÃ© atteindre pour Ã©norme sur toute web dans le cas oÃ¹ aurez besoin it trÃ¨s nombreuses. I’m pretty new at seitan and I want to try making a chorizo style sausage. The recipes all seem to use wheat gluten though and I’m not sure when to add the extra seasonings if I’m making it from wholewheat flour. If I add it to the first dough I imagine I’ll just wash it out, if I try to add it to the raw but washed seitan I’m not sure how I’ll manage to incorporate it… Any tips? Thank you for giving a ration for the recipe. I did not have the full amount of wheat flour on hand (and there are no 24 hour markets here) so having a ration and pictures really helps, thank you! I am definitely going to bookmark this site for future reference. Thank you for incredible illustrated instructions, you have made the new and unknown seitan world open to me! I started making seitan from white flour this year. We used to buy it, now I can only eat what I make. It’s time consuming, but not just cheaper if I make it, but the texture is better and I can impart taste to it. Before I put the seitan into a soup mixture, I add powdered onion bouillon to the mass, some salt and spices, knead it a little, let it sit in the frig for an hour and then put it into the boiling soup. That way the taste gets absorbed into the seitan. It’s not meat, and you have to be committed to the vegetarian experience in order to eat it. I loved this post. It is such a wonderful feeling to really put in that extra effort, especially when cooking for friends. Almost all of my friends are vegan/vegetarian and utilizing the whole wheat flour method makes it far cheaper to produce a large yield of seitan. I have primarily stuck to homemade lentil sloppy joes and taco filling for Tuesday dinner, but now everyone is coming over more often and I hate soy. So, thank you! A three dollar bag if flour feels way better than a $10 bag of a third the amount of wheat gluten. Question: have you ever combined wheat + wheat gluten for a firmer of softer texture. Ex. Breaded Nugget forms would need a more delicate texture than “steaks”. Thanks! Cover in water for 2 hours (more is fine too if more convenient). Rinse a few times (5-10) until most of the starch is gone and the seitan is rubbery – the water won’t be clear, but I haven’t noticed a difference in texture or taste. IMHO, rinsing it more is a waste of time and water. Cook on low in a slow cooker for 8 hours, or steam (wrapped in aluminium) for 30 minutes to an hour. That should amount to about 20 minutes of work on your part, including cleaning the kitchen. The rest is waiting. I am a vegetarian guy and have been looking for good protein sources for muscle building. Came across this and made it right away. Then cooked it as a stir fry with some onions, peppers and sweet corn – the dish is AMAZING! I wish I could post a photo here. I modified the stock and boiled it with some oregano, rosemary, black pepper and garlic only coz I wanted to go for the italian flavor. This thing is so versatile!!! Can the Saitan be baked instead of cooked in broth? Hi. This is a wonderful illustration of the process with real time pictures. I have a doubt though. You used 5 lbs of wheat flour. How much Seitan in lbs did you get as the result of this process? How much seitan does the five-pound bag of whole-wheat flour yield? How much would a five-pound bag of all-purpose flour yield? I’ve never actually weighed the yield. My guess would be about 2-3 lbs of seitan. Its a much smaller size then the flour when it starts out, most of the volume is due to the starch that gets washed out. However, the gluten is much more dense so even though its much smaller, I feel like the weight would still be about half. Test it and let me know!